Wow! Let's Make a Deal! Wood Exterior and Interior adds to the charm of this mountain cabin. As you walk in the front door the woodsy aroma let's you know you are in the Mountains! 2 Bedrooms, 1 Bath, Wood Floors, Walls, and Vaulted Ceiling with Beams. Loft Area for kids to sleep or storage. Covered Porch with Hot Tub. Privacy yet only 7 minutes to Franklin, NC. 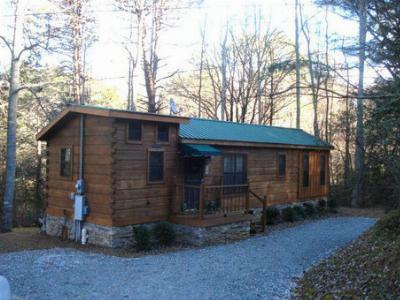 Centrally located just 5 miles southwest of downtown Franklin, NC, 45 minutes from Cherokee, NC, Great Smoky Mountain National Park and Harrah’s Casino. Asheville, NC is only 1.25 hours away. South Macon Elementary, Macon 5-6, Macon Middle and Franklin High School are within a 10 minute drive.